It’s always nice to have a few spots to loll around on or sit if needed. 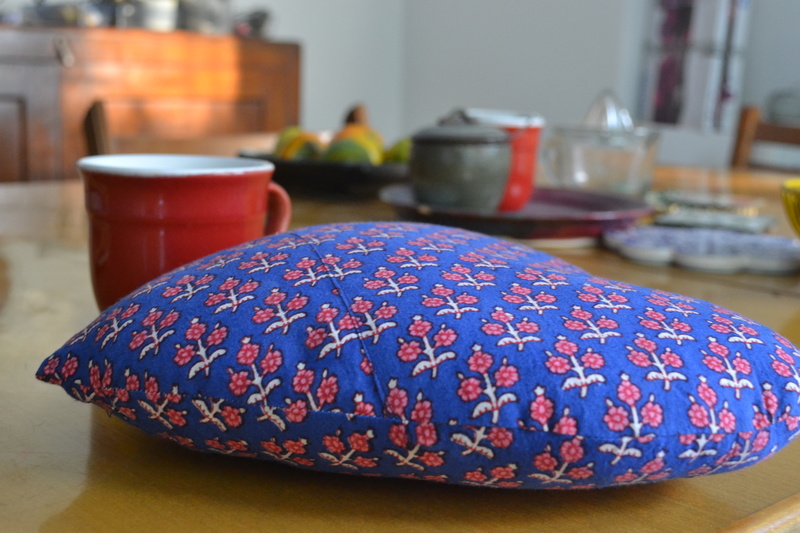 We had a couple of floor cushions that needed covering, and so I finished these a few days ago. 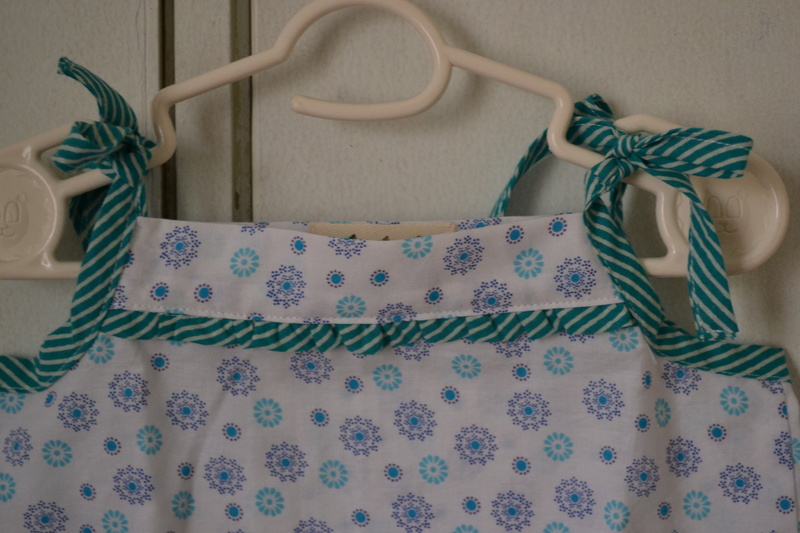 They are sized at 24″ X 24.” The back is simple envelope type with buttons to hold the edges together. 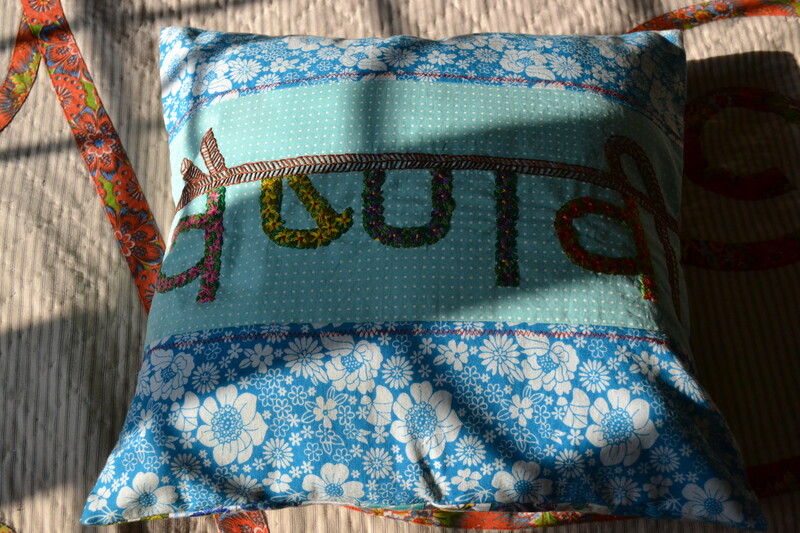 I used upholstery fabric remainders mixing some Indian fabric with Echino leftovers. Best part? They’ll stand a good deal of washing and playing…. And as summer comes we’ll find these to be more useful when gradually one shifts from from chairs onto cushions and finally to the floor! 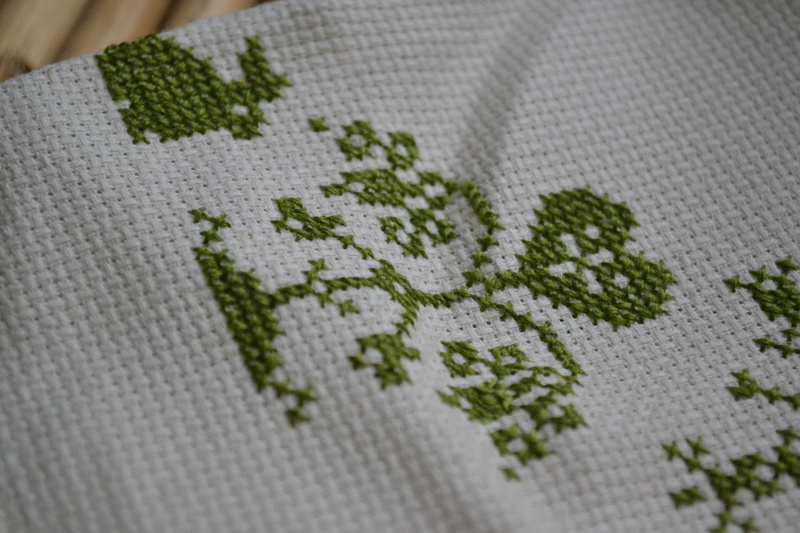 On a totally different note….I started a cross stitch sampler and here is a little peek at it. The pattern comes from one of my all time favourite books. It’s slow going and will probably take the entire summer (which here will last until October!!) but I am enjoying the slow pace of it. 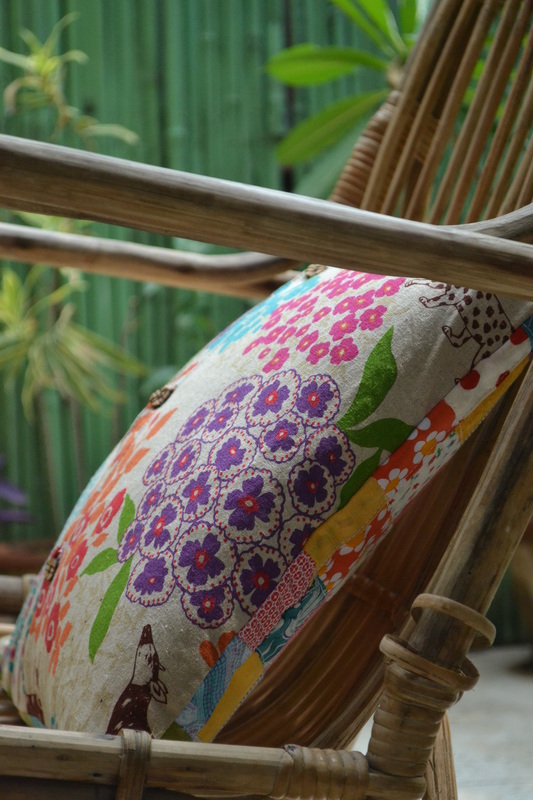 So what’s your favourite form of sewing when the weather gets too hot to sit at the sewing machine? Alas! I have such little to show you. It’s been more than two weeks, since I have made anything. 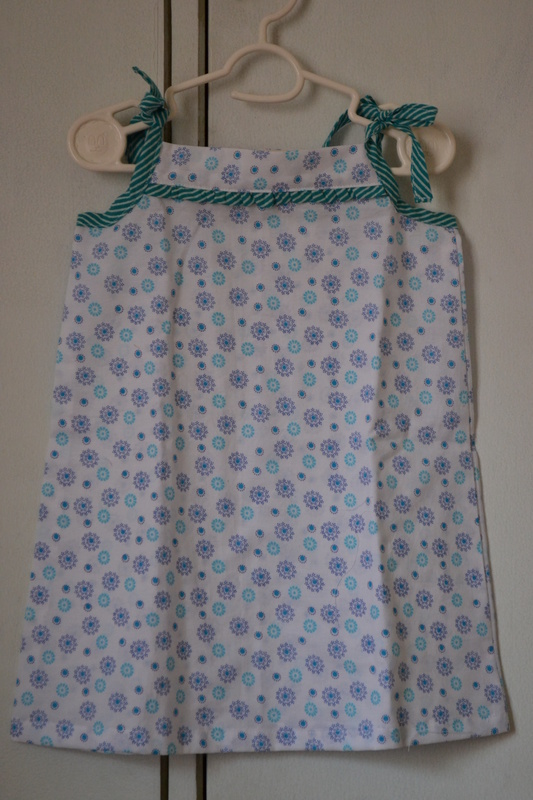 Lots of lovely guests and this and that, and I am itching to get back to the sewing table. But the days have been flying, and it is almost already middle of December. And in less than two weeks we hope to leave for our yearly winter vacation. Last night I finished this cushion cover, mostly because I was desperate to make something that would lead to some immediate gratification. I had this idea in mind for a while, and one can never have too many cushion covers right? Trust me, I took my time with this as well. These little things which are really just two pieces of felt on top of each other and hand sewn to the front took forever for some reason. 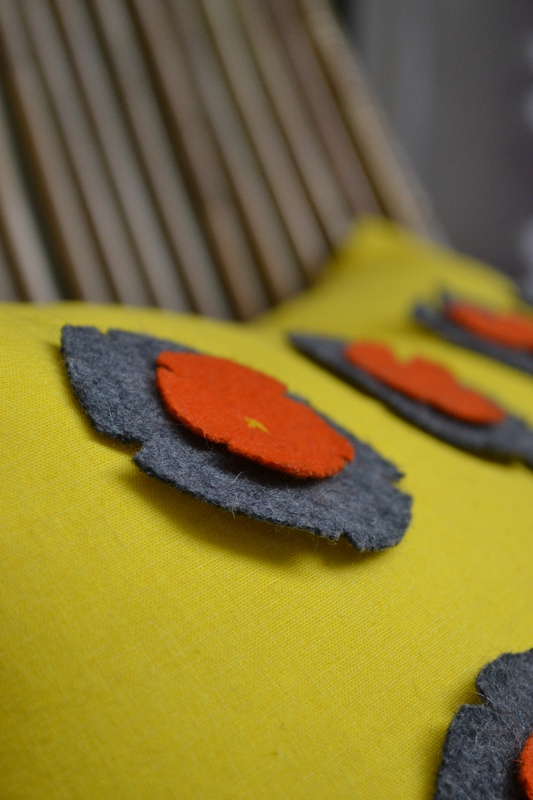 The yellow linen I believe is from the Robert Kaufman line, and and little pieces of felt are scraps (received from a friend). 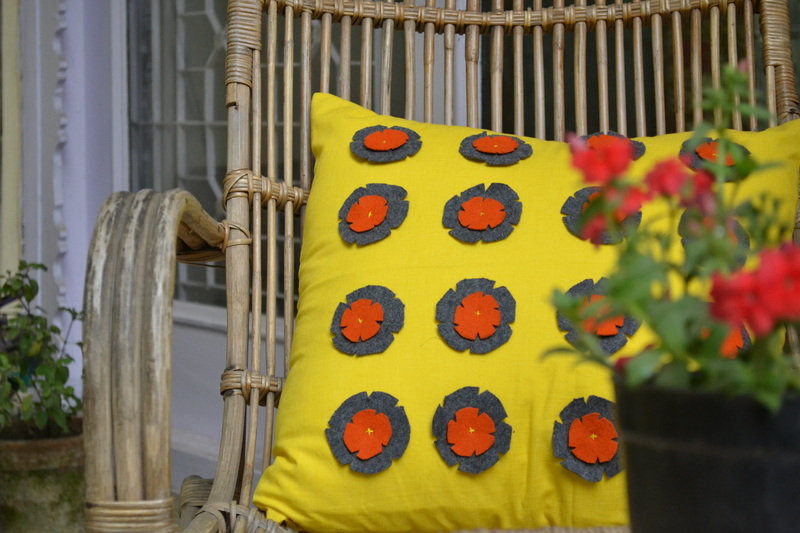 I had the idea of making these for a while from here, except that I used felt instead of linen for the decoration. So there. I hope this little project gets me out of current state and I get working on a few other projects lined up on my table. Thanks for visiting. And I promise to be back soon. 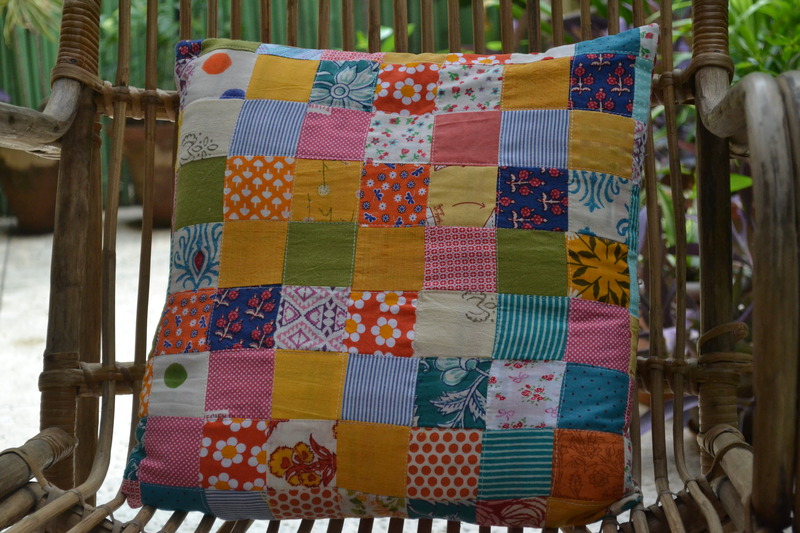 Last week N’s teacher asked me to cover a pillow that the children use in their “sleeping room.” N was delighted when she found out about this and couldn’t stop asking–“so didi has asked you to do this because you can sew?” and “can I choose the fabric?” and many more questions. Mostly I think she was excited because she could carry the pillow home from school for the holidays and then bring it back to her friends with a brand new cover. 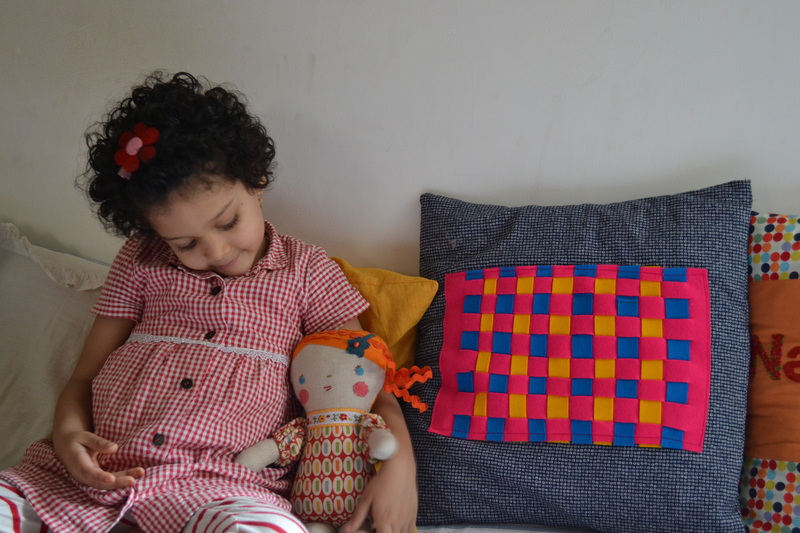 So last evening, as she made drawings of the clothes she is planning to make for her dolls, I finished the pillow cover. 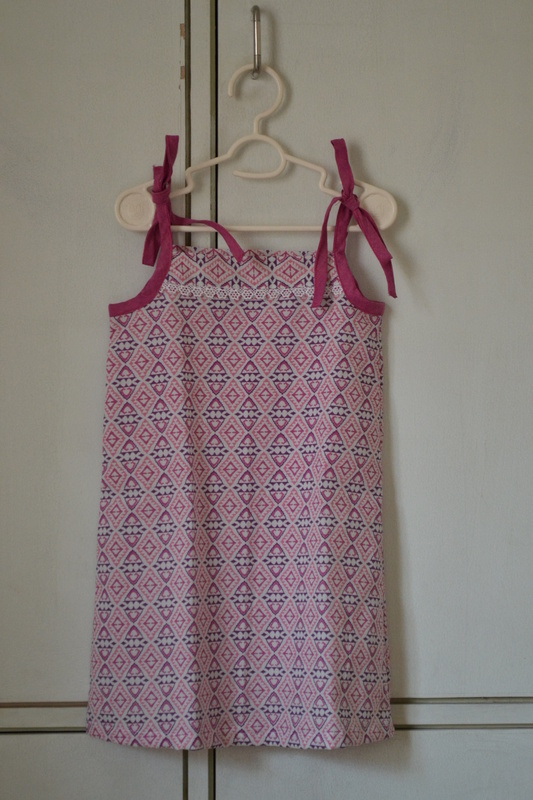 The fabric is recycled from an old top of mine. 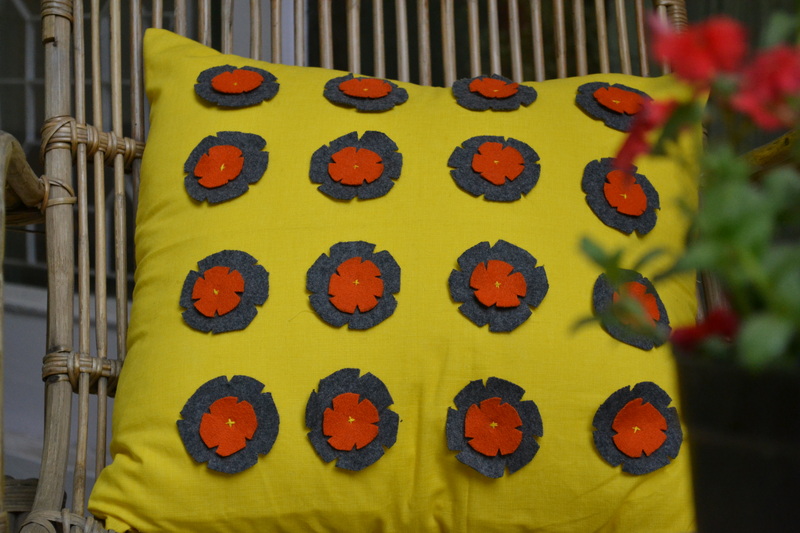 I just traced the pattern on the paper using the cushion insert and cut pieces accordingly. The cover has velcro opening (sorry no photos of that! 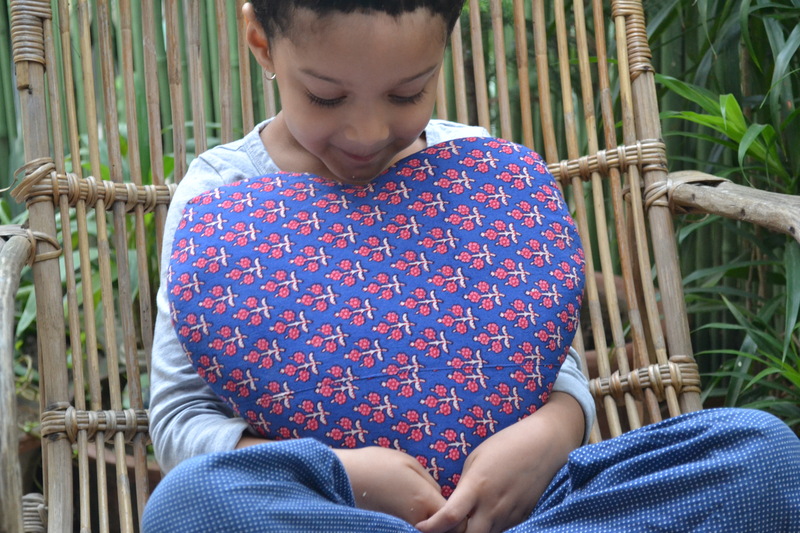 ), and I did the opening before cutting up the two heart shaped pieced and sewing them together. It was easier to do it that way, but I also underestimated the length of the opening required to stuff the pillow and so it needed a few last minute adjustments. And then of course, there is the little label of which you can catch of sight in the first photo. N was over the moon when it got done. Usually not given to any excessively loving declarations, she told me that from now on when she misses me in school she is going to hug the pillow. Of course she doesn’t miss me in school (another declaration of hers :-), but never mind that. 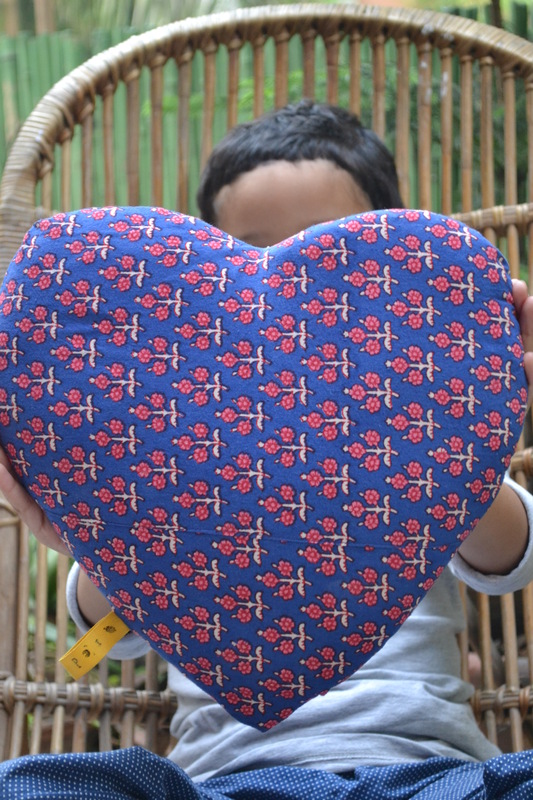 Oh, and then a few moments later when M saw it, he told me of how it reminded him of the freaky heart pillow in this movie. Ha ha. Thereon, I couldn’t really look at the it the same way anymore! Anyway. N, who has no such references is super happy. This one photo shoot certainly posed no problems for us! Oh, and just because she asked me, here is a picture of all the dresses she is planning on making. Certainly she looks more prepared from KCWC than me! Hello again, after a break much longer than I anticipated! 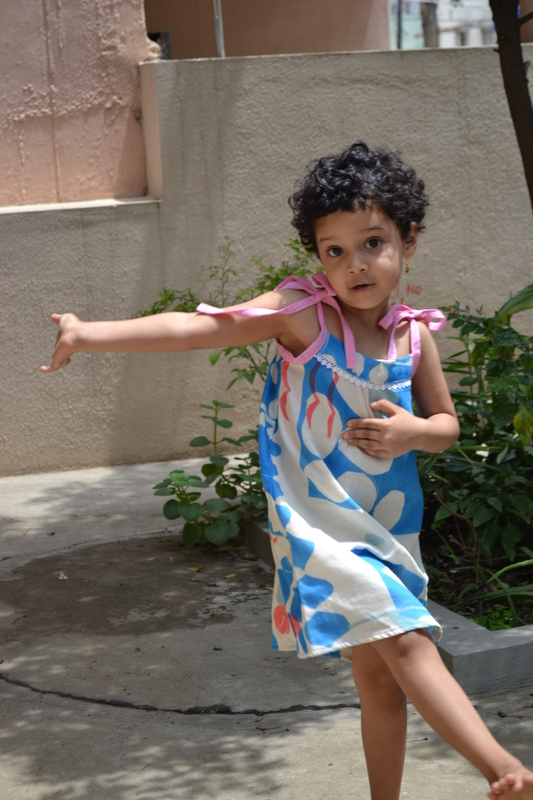 We ended up staying in Pune longer than intended partly due to lack of train reservations. But the trip was lovely–much relaxing and good eating was done by the parents (us), and N throughly enjoyed her time meeting new and old friends (the “social butterfly” that she is). 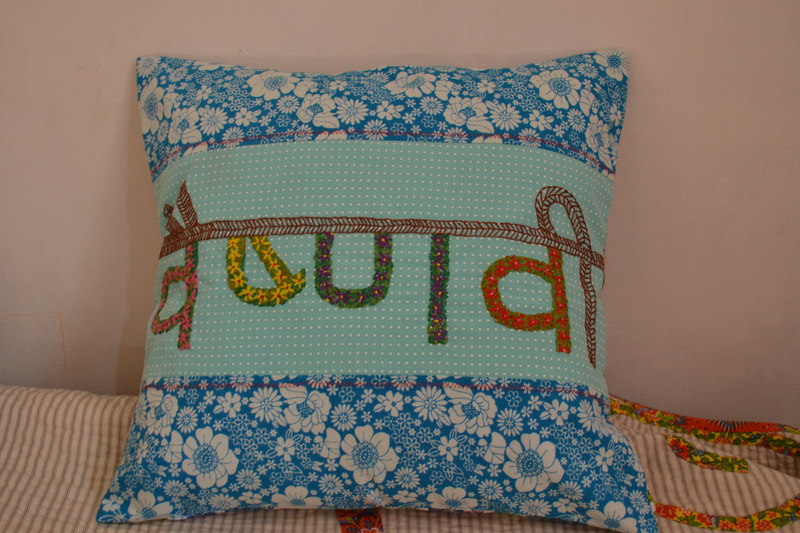 It’s a really simple cushion cover measuring 16″X16″, with the birthday girl’s name embroidered on the front and a bit of decorative stitching that goes around it. 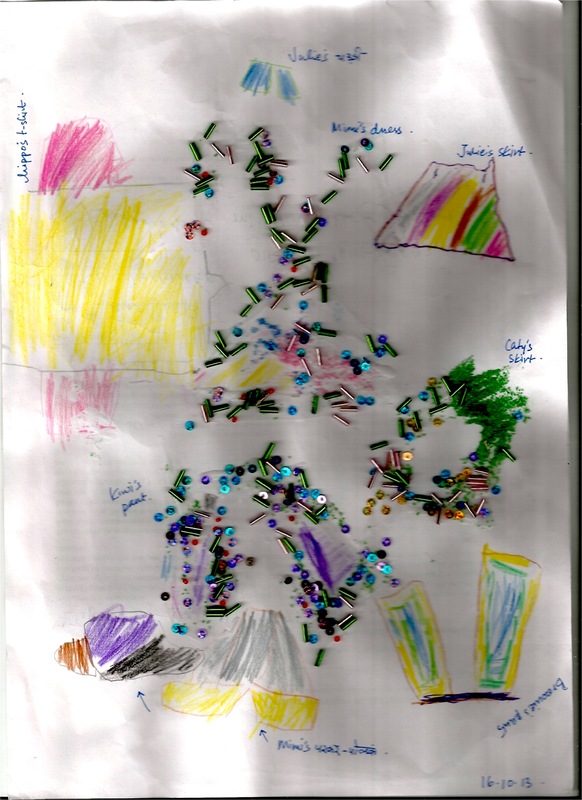 I used a lot of little bits of cloth to make it colourful and decorative. 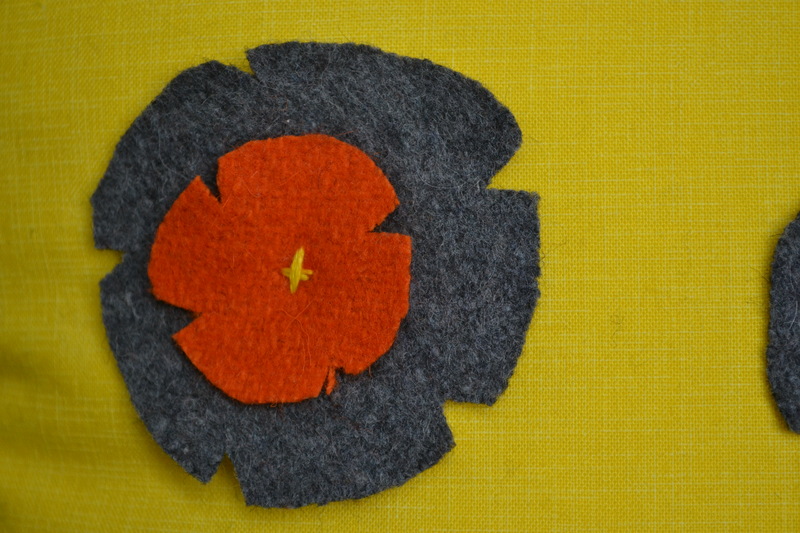 The back is more scraps and the cover closes with two lovely red buttons. 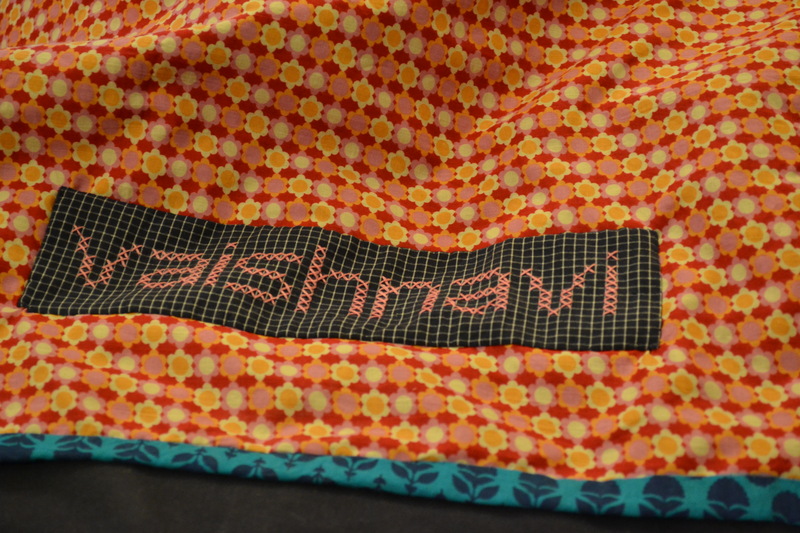 It’s the first time, I did the embroidery in “nagari”so that was a bit of a challenge. But I loved how it came together and while I may have complained a few times about how slow going the embroidery was, I am glad I decided to stick it out. 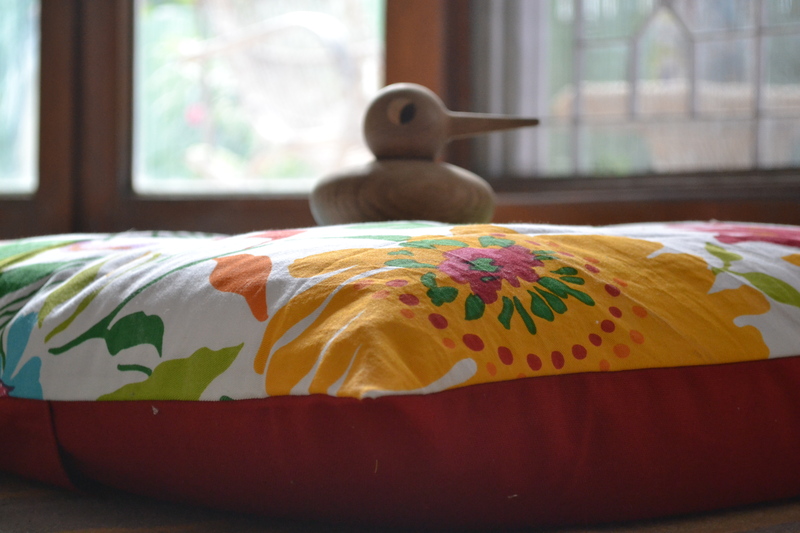 Cushion covers are usually my instant gratification projects, but I did a couple of things differently with this cover which I am really happy about. The first was to line it entirely, i.e both the front and the back. 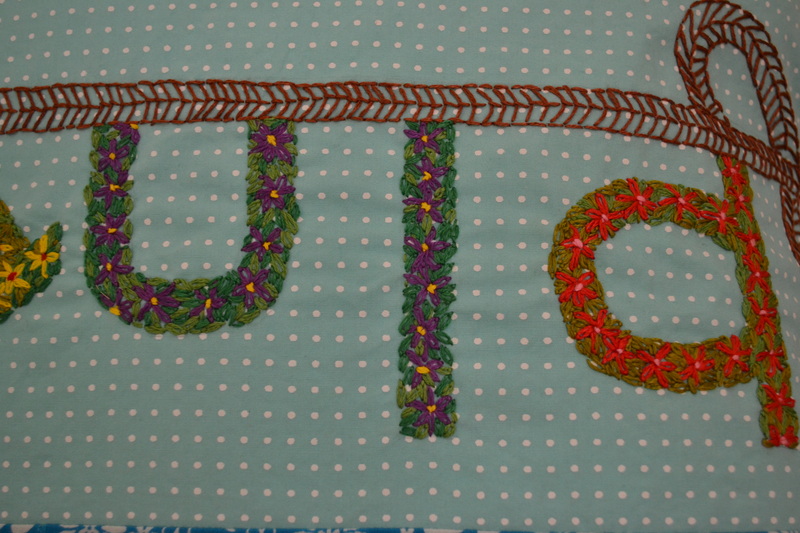 Then I did a bit of decorative stitching with the machine around the embroidery. 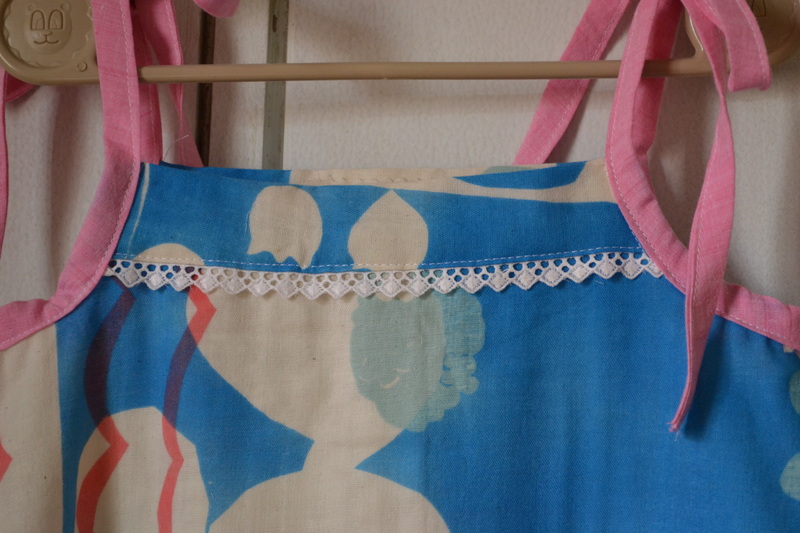 I used French seams for the entire cover (sorry, no picture of this). And finally, and my most favourite thing was to put a special label inside with a message. I know that others may hold differing views on this one, and may find my love for label making and putting a bit excessive, but I am really in love with the idea of labelling and the possibilities that open up with this. A little peek to find a message, and to know that it is especially for someone special whose birthday it is can be pretty exciting. At least I think so. 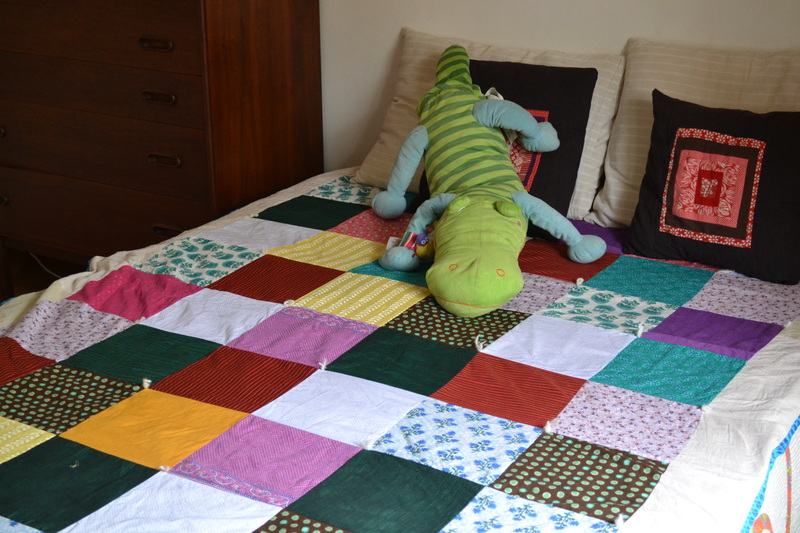 About half a year ago, Amolika (V’s mother) commissioned a quilt for V. Since I like to use older pieces of fabric especially when making quilts for children, and Amolika was quite happy with the idea, I decided to use all that we could from V’s old clothes. Something that would remind V of her favourite clothing, and that which would stay with her as she got older. 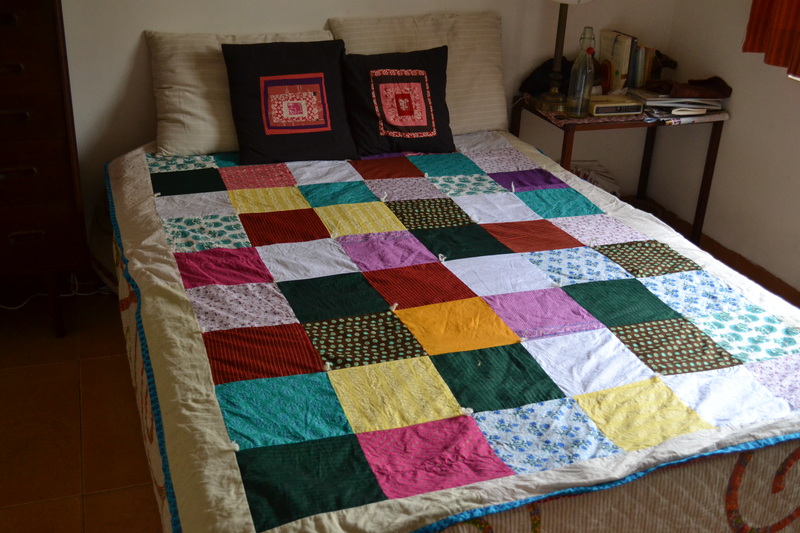 The quilt measure 5’X7′ and is made up of whole bunch of 9″ squares. 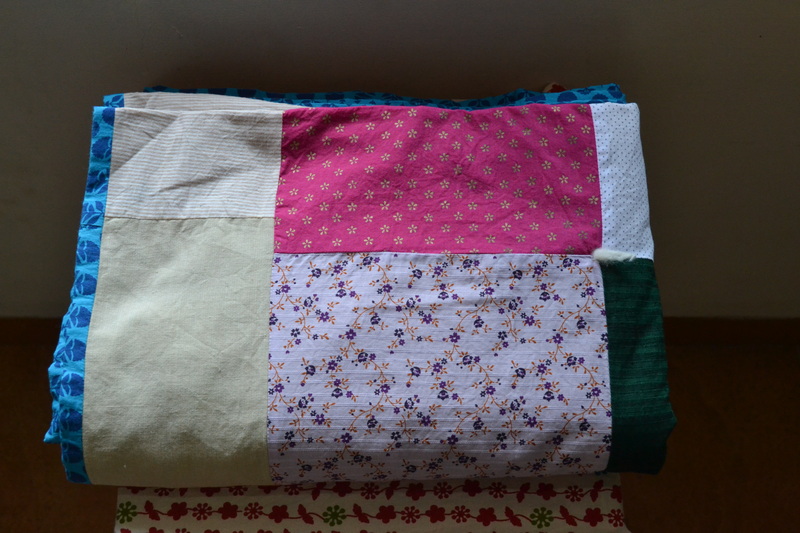 I used some new fabric, but at least half of the squares came from V’s baby clothes. 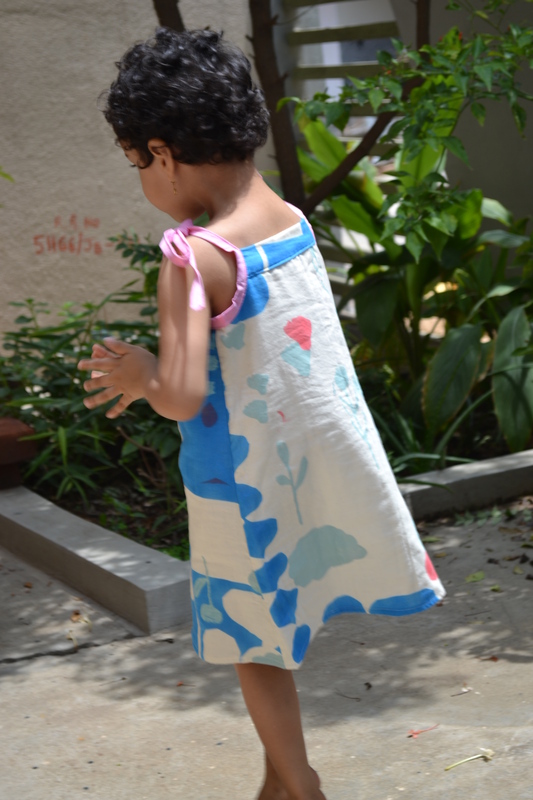 The cream borders come from her father’s kurtas, and instead of batting I used Amolika’s sari as the in-between layer. Finally the back has a really simply label (yes, I am quite obsessed with these), this time with V’s name in simple cross stitch. 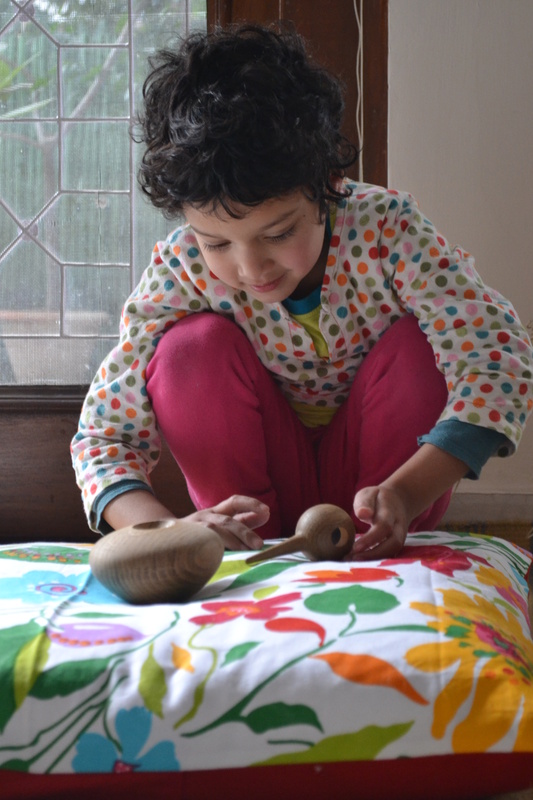 Amolika tells me that V loves the quilt, and I am really so happy. 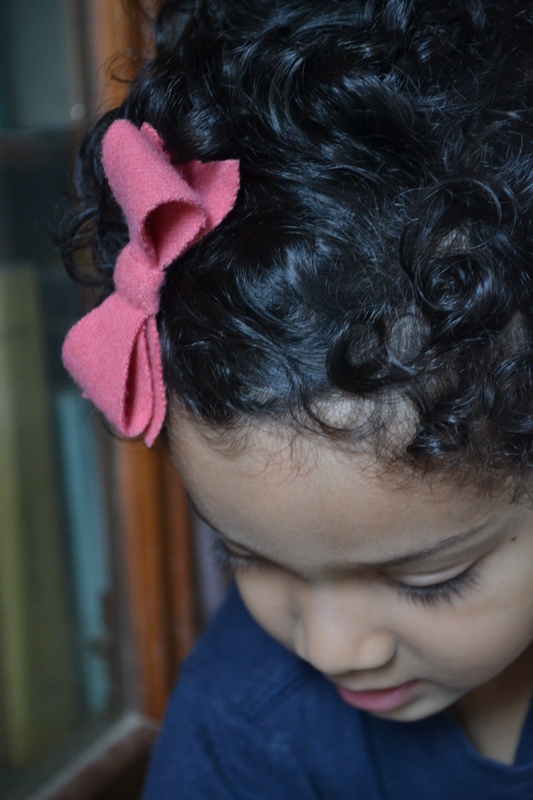 She has been a fantastic teacher to N when she started montessori, and I was first introduced to V by N as one of her “friends.” In fact, I think she is one of N’s first school friends, someone whom she met entirely on her own without any parental interference. I still see V once in a while because she now goes to the “big children school” as N tells me. But she is a sweet sweet child and it was a pleasure for me to make this for her. This is all from me today. Still, much to tell, and lots to show but more of that when I come back. Two days before we left for our trip I decided that it would be so much better to make rather than buy some gifts–especially for the kiddos. Not a bad idea in itself, but not such a great one 48 hours before boarding the plane. 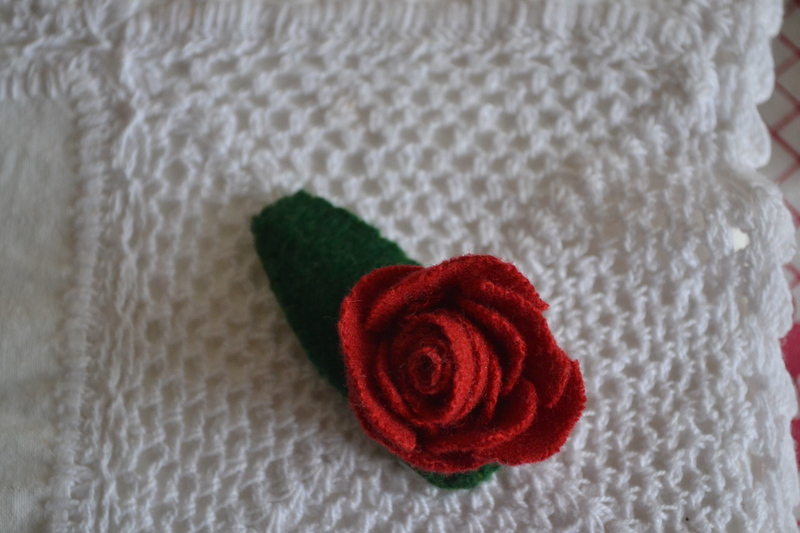 The thing is that usually I do like to make stuff that I give other people. But this making requires a bit of thinking and planning, and this particular trip involved so much of planning that I gave up the idea of “making” early on. Or, rather, I outsourced some of the making and got some delicious biscuits from here. But the children that we were going to meet on the trip still needed something, and I really should have bought. But…I did not look hard enough to find something that I liked. 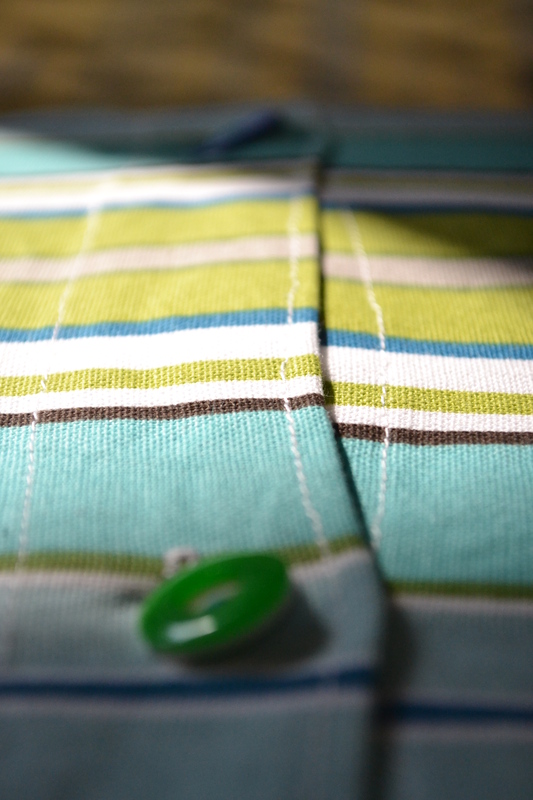 Instead I came up with this idea that I make something at the last minute–yes, two days before leaving. 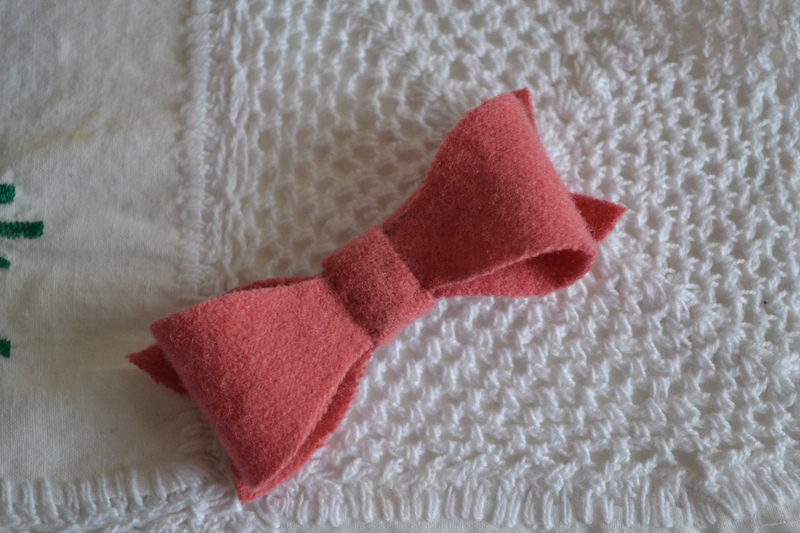 And yes, that means everything from tracing the pattern, cutting the cloth and actually making the gifts. And that too something I haven’t made before. Madness! I know a lot of people who are really good at this kind of stuff, getting their act together two minutes before they are out of the door. And really, while I might sound like that’s a bad idea I do envy these people. But I am not like that, and if I try it, everyone around me and I end up in a really bad mood right before leaving. I apologise for the poor quality of the photos. They were taken “last minute” (needless to say) and I feel that the absence of a model makes them appear a bit flat. 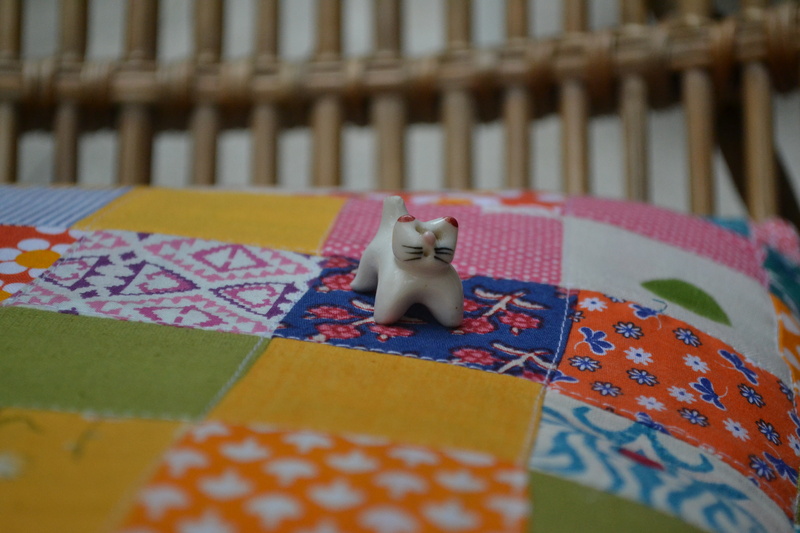 The photos are however way better than what the sewing experience was like–a bit of a nightmare. In other words more than few things went wrong: like sewing the wrong sides together, getting the seams not exactly right, ETC. Nothing that could not be rectified, but really nothing that needed to be done at midnight. So despite having such a lovely and simple pattern to work with, the lack of much joy in this bit of sewing was entirely my fault and not of the pattern. This one comes for as a free download available on the Oliver+S site. 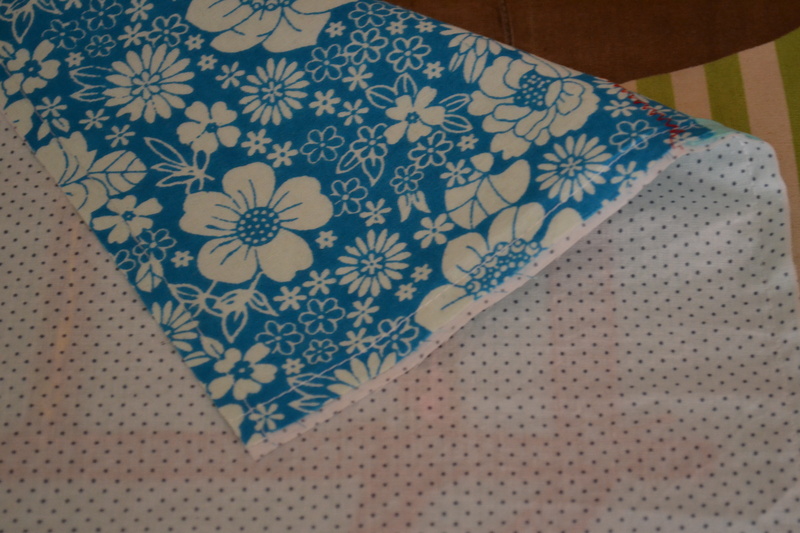 The fabrics I used for both are cotton that I got locally. 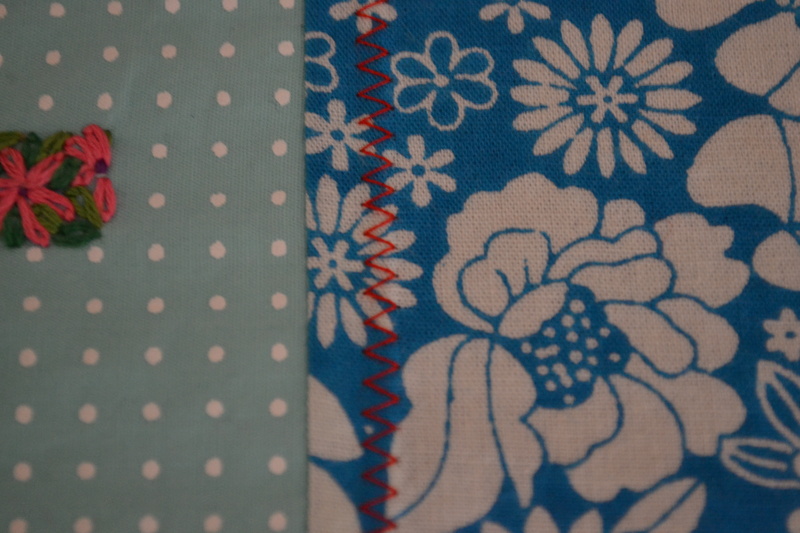 For the blue frock, I decided to use a bias tape in place of a lace between the bodice and the skirt. It turned out well I think (despite the fact that I had to redo it twice). 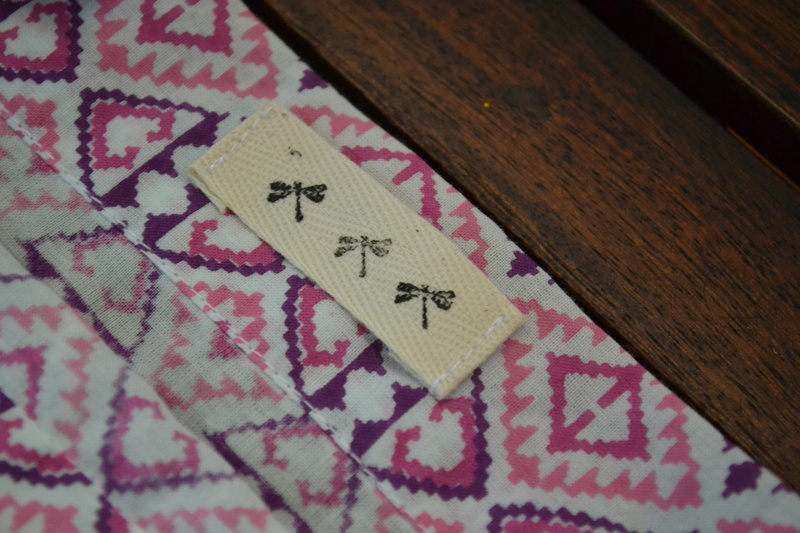 I have just recently started putting labels on the clothes that I make and I think this allows for a whole new bit of creativity. 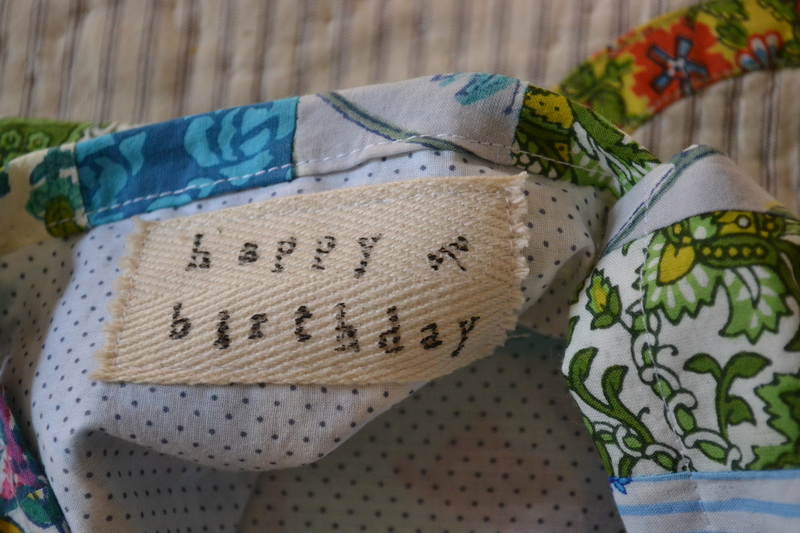 Here I used a piece of cotton ribbon and stamped it with my current favourite motif. I have tried something like this here on N’s clothes, and I am thinking that a whole lot can be done with this. But more on this soon! Anyway, so that was the end of my last-minute saga. Not something that will be attempted anytime soon. I am happy to say however that the gifts were appreciated, and that always makes me want to make more of the same. 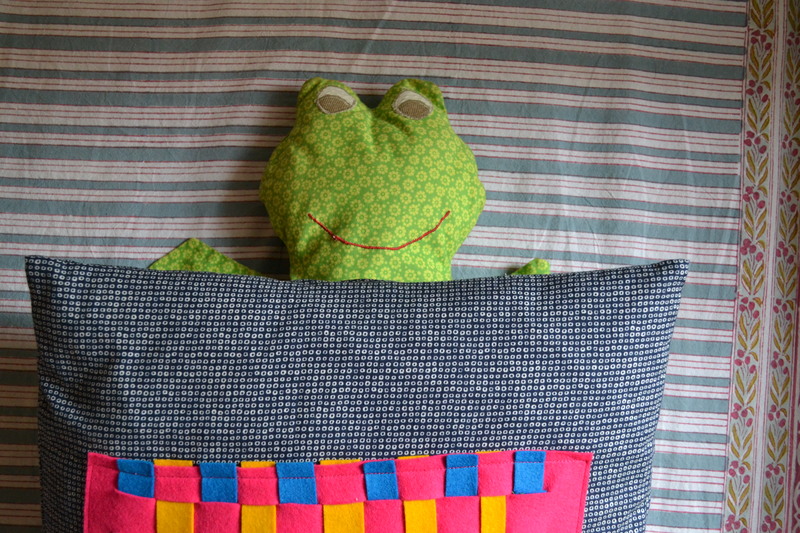 And so, the day I got back from the day, this is what I did!–yes even before I had entirely finished unpacking. 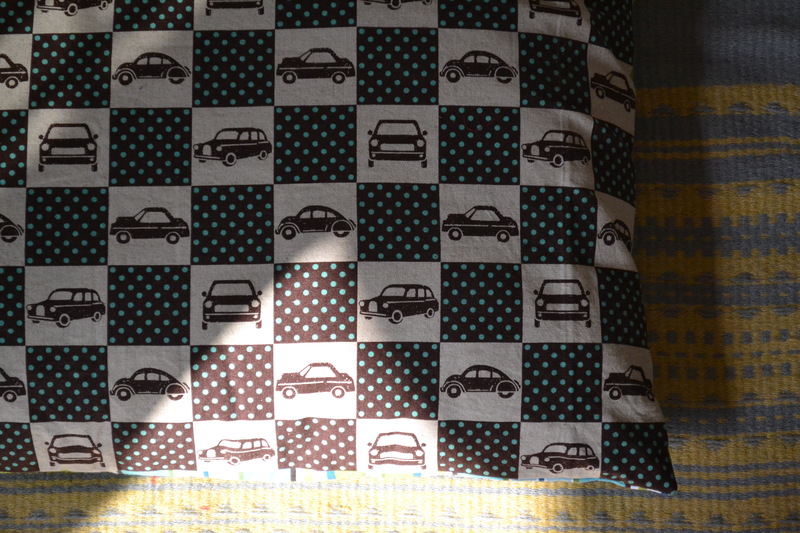 The pattern is exactly the same, but I decided once again to pull something out of my half yard Japanese fabric collection. 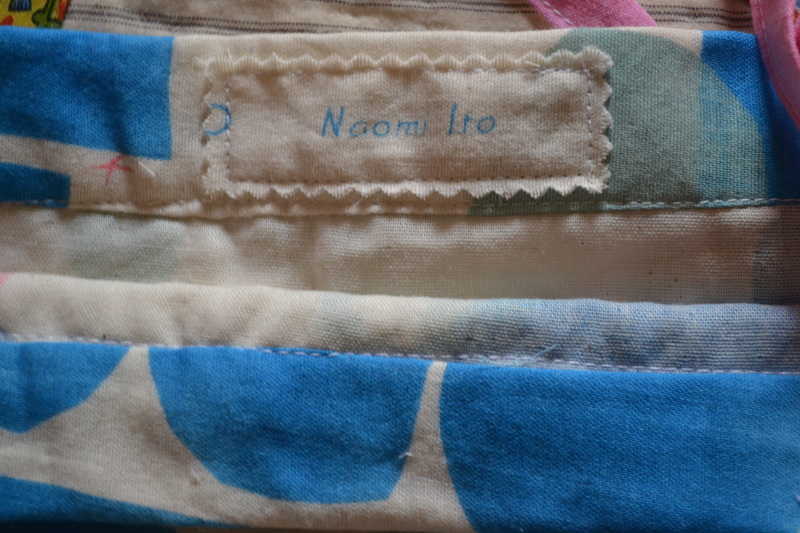 Can you tell it is from the lovely Nani Iro line by Naomi Ito? Of course, given that I was not running on any kind of a tight schedule to make this one, and that I had made all the possible mistakes I could make already, this took all of about three quarters of an hour from start to finish! Immediately worn and well appreciated too! My only little complaint (not the model’s, and certainly not a problem of the pattern) is that I feel it is a bit too wide at her chest. N has a small chest and narrow shoulders. So depending on the pattern the chest can be a bit wide on her. 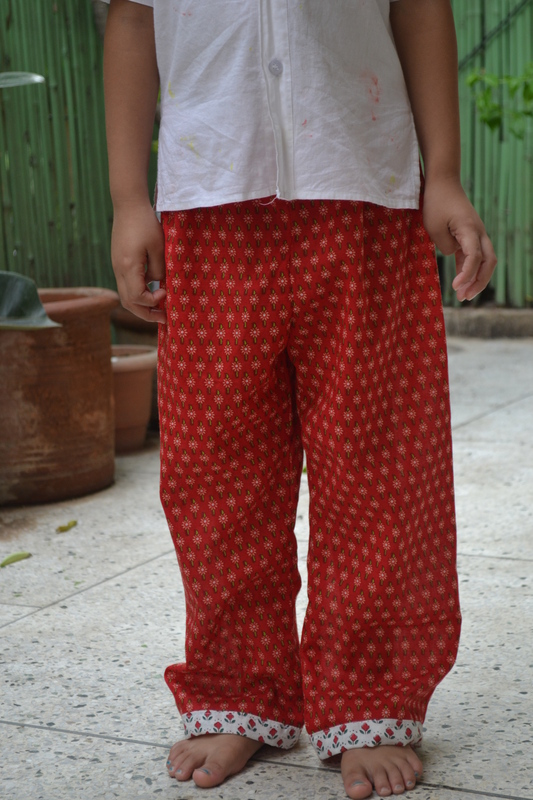 Here I should have perhaps used a 3T or perhaps even 2T size with increased length. Well, something for me to consider for such kind of dresses with spaghetti straps. And here is the tag I put on the back. 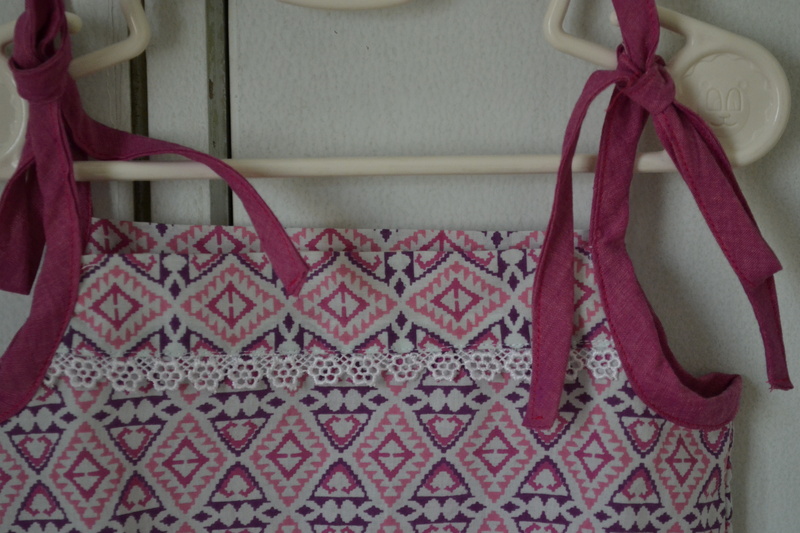 Just because I could not bear to waste any little bit of the absolutely gorgeous fabric. And, finally there is one more thing to show, this time with N’s work in it. Here is what she made a little while ago and I put together. 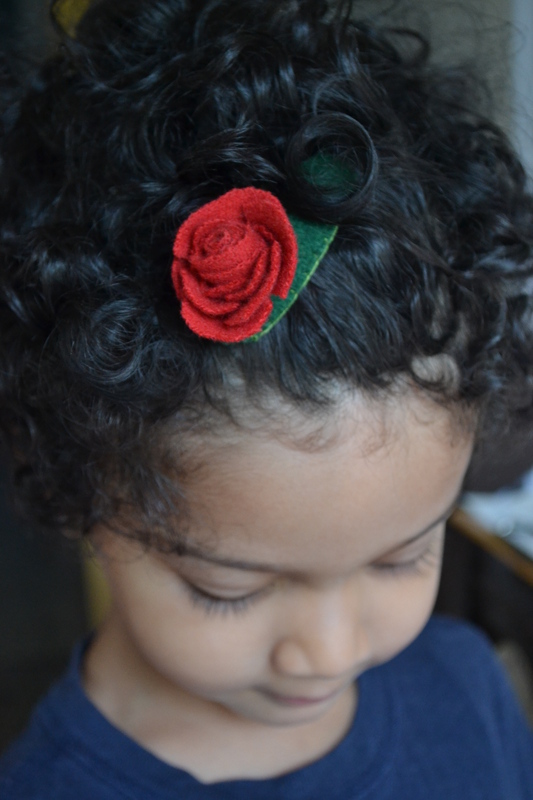 We made this, specifically, she made the centre piece with a bit of felt that I cut up for her. 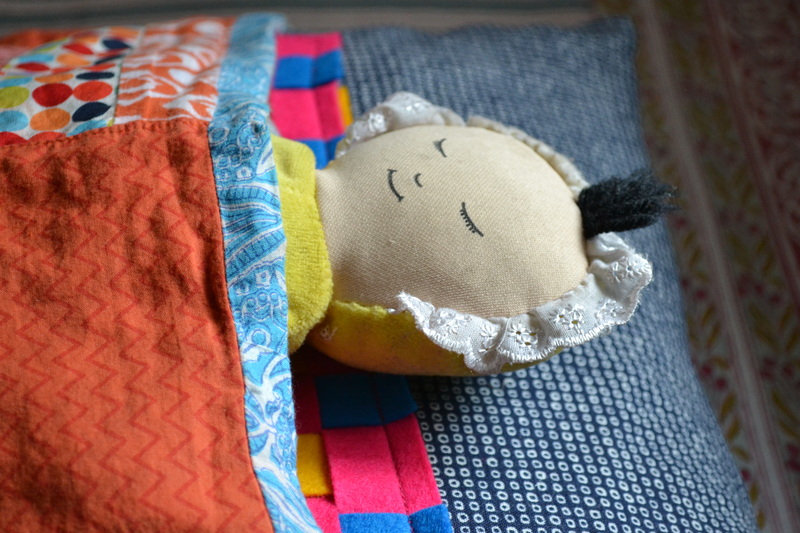 While I have done this with strips of paper as a child, the genius idea of using felt to make this came from “eclectic mom” who did a guest post here. Really what I great idea. The weaving is entirely N’s, and my job was to pin each strip in place once done, and push the strips up tightly next to each other. Once she got the hang of the weaving part we were done in about an hour. Not bad for a four year old! 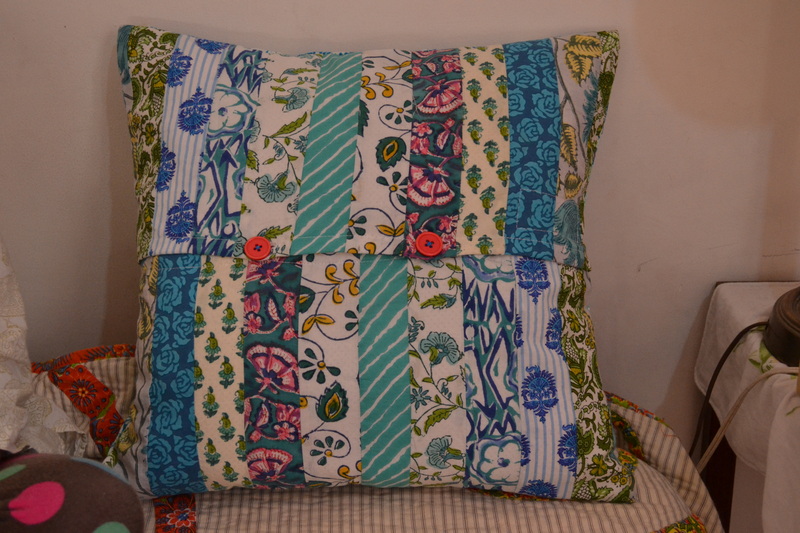 I put the cushion cover together, again using fabric from my half yard Japanese fabric pile (perfect yardage for really simple cushion covers). So here is the back, really plain and simple. 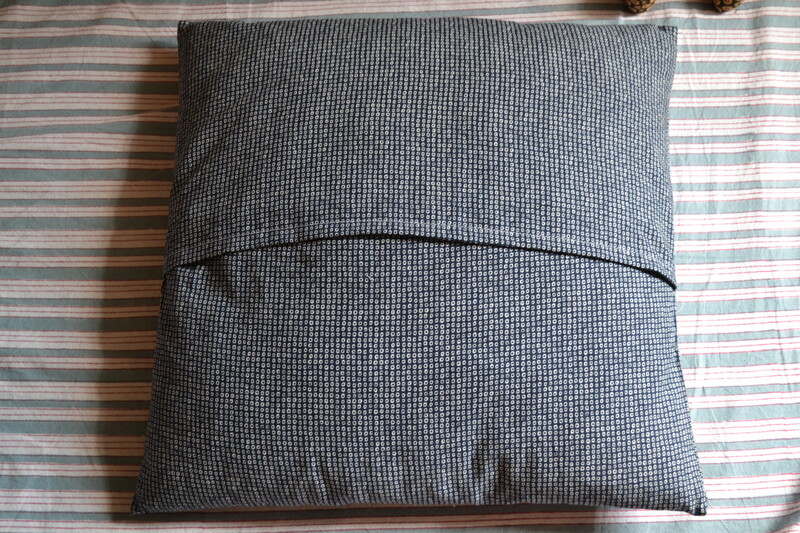 As you can tell, the only thing that I did differently from the instructions on her blog was that I put in a cushion insert. 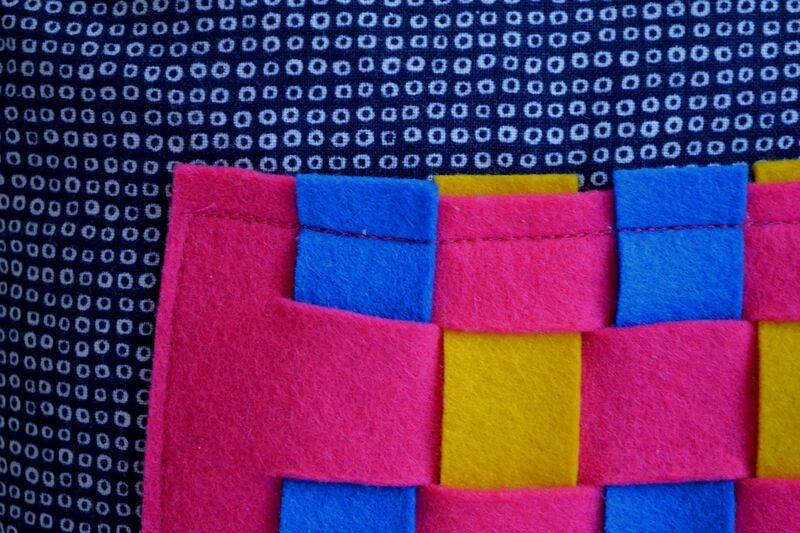 Also, I sewed the whole woven felt carpet to the top square of the pillow just to give it some more stability.